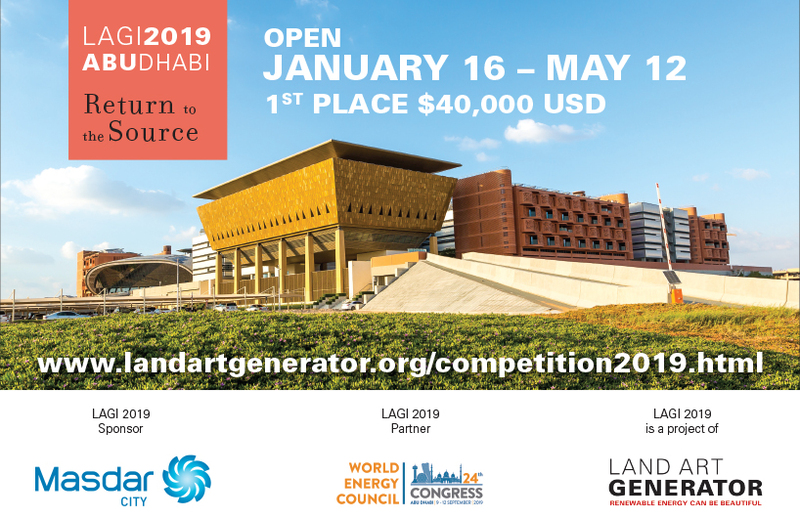 It’s been a big week for us with the announcement that Rio Iluminado won the LAGI Willimantic design competition in Connecticut. We’re floored by the community’s will to transform their town into an exciting new destination for people from all walks of life, and look forward to stepping into the project’s next phase. Meanwhile, we recently caught up with the Baltimore group behind Sun Stomp, an interactive solar-powered audio and video environment that comes alive with a throng of happy stompers. First, the details. A scaffolding sculpture with two sides — an interactive, 34-foot-tall projection screen on one face and a sloped array of 16 290-watt solar panels on the other, along with elevated bleachers placed 30-feet away from the screen and illuminated by neon LEDs — Sun Stomp produces (and stores) enough energy to power a regular Baltimore home for a year, according to the Collective. 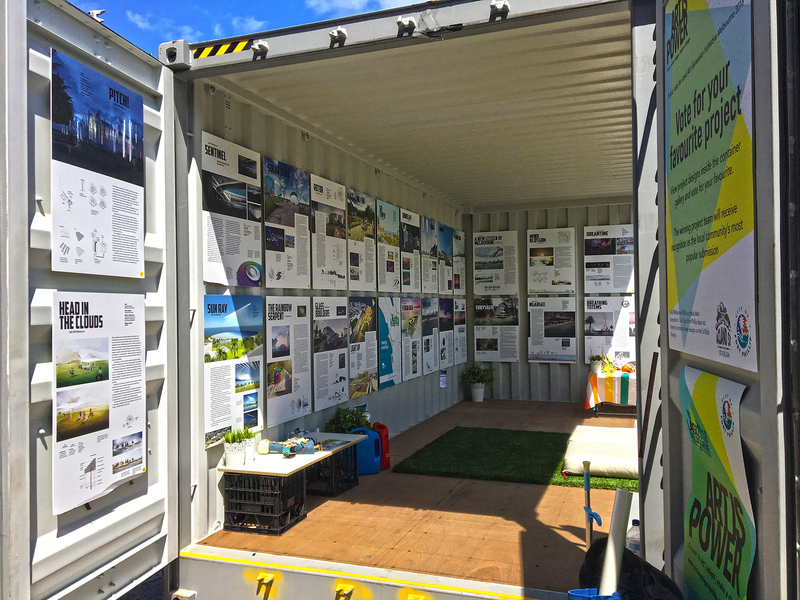 Of course, nobody is suggesting we should all build bleachers in our backyard and make a bunch of noise to annoy our neighbors, but the project does demonstrate that a pinch of creativity applied to clean-energy generation delivers a smorgasbord of benefits. 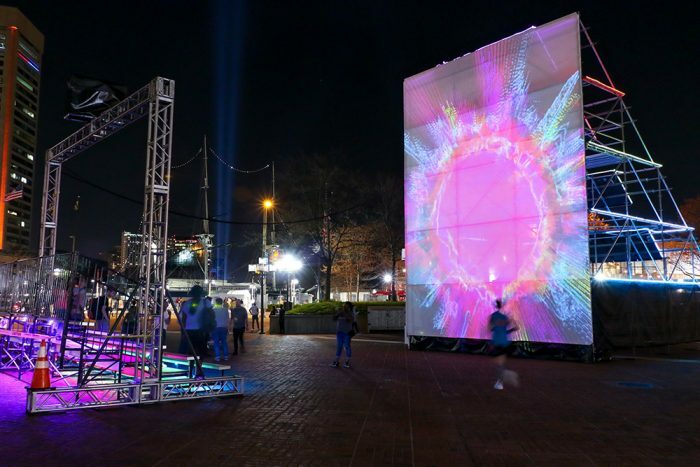 Judging by photos and videos captured during Baltimore’s recent Light City festival, where Sun Stomp made its neon-tinted debut, visitors were captivated as their wild stomping triggered sun-inspired visuals and amplified sounds derived from NASA’s Solar Dynamics Observatory. 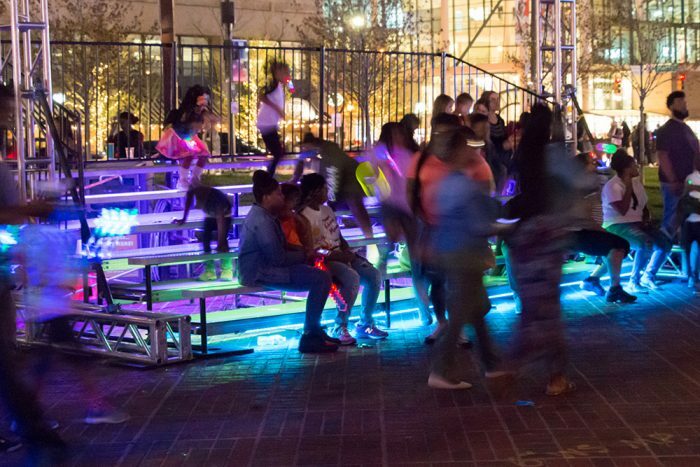 Coreil-Allen teamed up with Matthew Weaver, a solar engineer with a social conscience, along with sound and video guru Mark Brown, to conceive a project for Light City. Said to be the United States’ only large-scale international light and ideas festival, it was held this year from April 14 – 21. 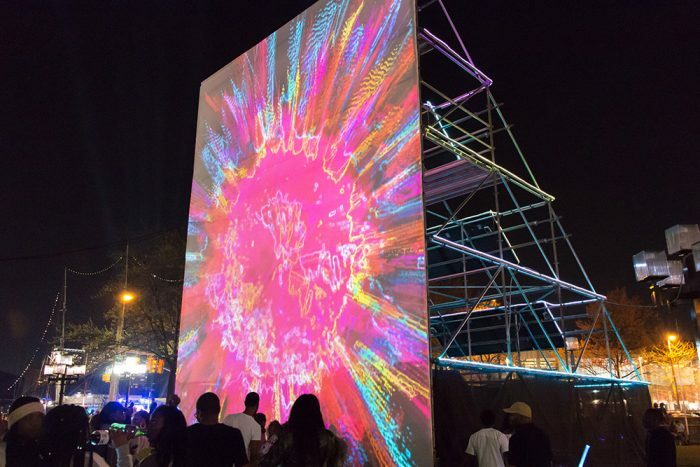 A public artist, Coreill-Allen says he has observed that colorful, interactive projects tend to do well at the festival, but he wanted to go one step further. “I thought it would be cool to also bring a social component into the experience,” he told LAGI. The trio brainstormed ideas over food and coffee, and Sun Stomp was born. Brown outfitted the bleachers with a set of eight contact microphones. “So when people stomp on, walk on or otherwise physically interact with these clangy aluminum and steel bleachers, those audio signals are picked up and processed through the program he [Brown] has configured,” says Coreil-Allen. That movement then activates “very loud, popping, vivid imagery” of the sun on the projection screen, as well as various audio samples, and then brightens LEDs under the bleachers and outlining the entire scaffolding structure. This is right up our alley. We love any collaborative public art project that combines art, clean-energy generation and education with a playful spirit. So much more compelling than a plain field of photovoltaics. 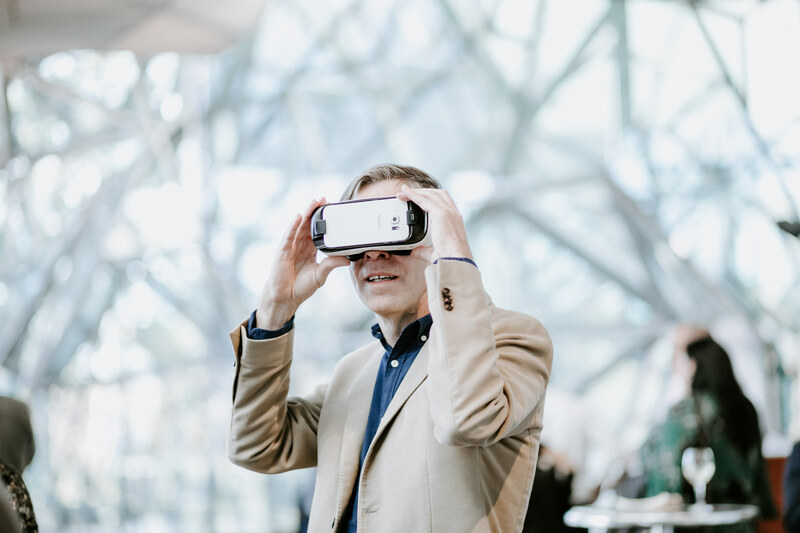 But there’s also a practical element to the story that is particularly relevant to public artists who face the eternal challenge of digging up funding. 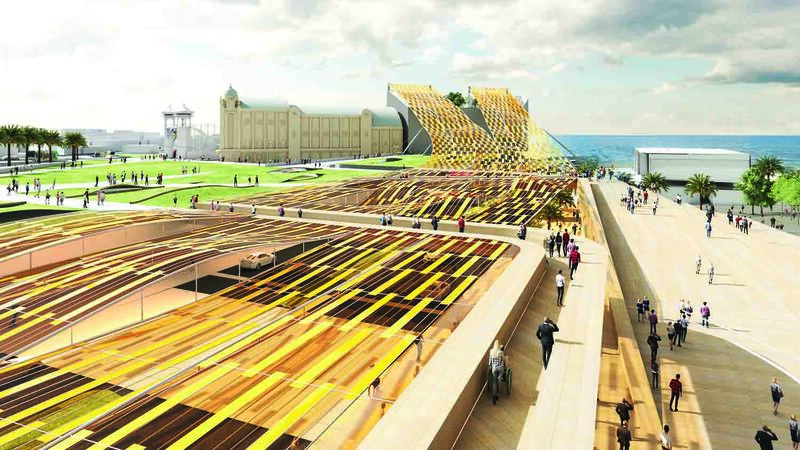 Coreil-Allen explains that the idea of a solar-powered artwork first stemmed from another project. He was in talks with the City of Baltimore to produce a piece with internal lighting, when the subject of energy came up. Coreil-Allen had to figure out what permits would be necessary to run conduits to deliver city power to his sculpture, and naturally the City wanted to know who would pay for it. He realized he could avoid a lot of red tape and make the project renewable by simply using solar power. With Matt, he says they were able to engineer an elegant way of integrating the solar panels with the sculpture, which Mark brought alive with color and sound. 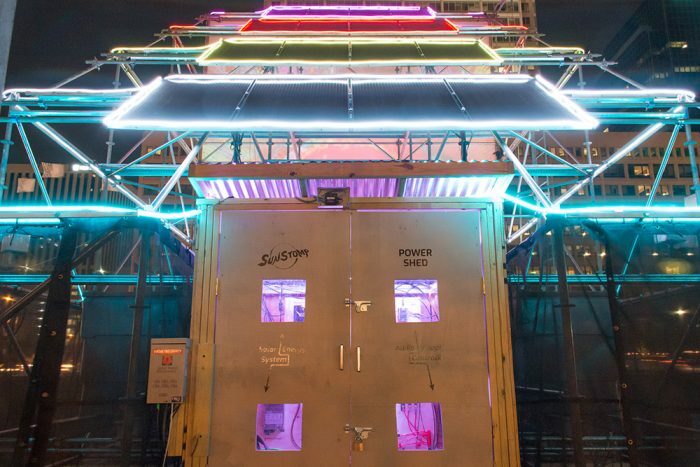 Sun Stomp Collective is currently in talks to share their art energy generator elsewhere. Follow them on Facebook to watch as they grow. All images via Sun Stomp Collective.